Having adored Daphne Du Maurier’s novel and found the 1940 film in the Criterion library, this seemed like an opportunity too good to miss. So, alongside my friend Abi (username: laurenceoliviersucks which should tell you a lot) we watched the 2-hour feature and took notes (not all of them entirely serious, many greatly in favour of Jasper the dog) and evaluated the adaptation. The opening scene was taken almost verbatim from the beginning of the novel and as my eyes adjusted to the black and white, the introduction to Manderley was as I had imagined, mind’s eye winding through the trees to arrive at its shadowy ruins. From there, the plot moved on with excellent pacing, matching the whirlwind infatuation of the anonymous heroine to aloof Mr de Winter. Her judgemental companion Mrs Van Hopper was adapted to a tee in her laughable hypocrisy and snobbery. However, we assumed a level of nuance associated with Hitchcock’s famous suspense that didn’t particularly materialise. Having seen modern thrillers like Get Out, there was a glaring lack of subtlety in piecing together Rebecca’s story. From Maxim’s visible shudder at the second Mrs de Winter’s: “I’d sure hate to drown” to the easily overheard conversation of servants who otherwise showed silent decorum; the feeling of unease I was meant to feel turned to impatience – I wanted the characters to just say what they were so badly concealing. We conceded that despite Abi’s deep-rooted hatred for his work in Shakespeare, Olivier was suited as a Byronic male lead, unsurprisingly considering his earlier role as Heathcliff in Wuthering Heights (1939). But the fear of his true depths and capabilities were diminished by one of the deviations from the original story. Though his revelation was one of my favourite scenes in the film: panning slowly through the empty shack like Rebecca’s spirit was re-enacting the fateful confrontation, they shifted his blame. Though producer Selznick aimed to be as close to the book as possible, discarding the changes Hitchcock suggested, the Hollywood Production Code at the time stated that the murder of a spouse had to be punished. In implying that a fight ensued, one which Rebecca intended to lose, the verdict of suicide on her part and manslaughter on his is given more weight. Mrs de Winter’s reaction is therefore justified in support of her husband, somewhat dampening the dark heart of her madly unconditional love. In the book, the fact Maxim didn’t love Rebecca is enormously relieving to her, contrasting greatly with her minimal concern that he just confessed to murder. The casting of Judith Anderson, though younger than the motherly version in the books, made for a more sycophantic Mrs. Danvers. Her obsession was made more sinister in youth, life seemingly revolving around her love for Rebecca and in the end, her death. While her involvement in the fire is only implied in the end of the book, seeing her standing amidst the flames and the R embroidered pillowcase burning, was a far more melodramatic ending. On balance, Rebecca is a faithful recreation for the most part, but in translation to the screen is less psychologically tense but more overtly Gothic. The mansion and servants would fit right in with The Addams Family; Joan Fontaine’s Mrs de Winter is the quintessentially pure, naïve heroine; there is a clearer binary of good and evil which was reinforced by the censorship, and the fiery destruction of Rebecca’s spirit through Mrs Danvers is an ending reminiscent of Dracula. However, the difference kept us watching and it surprised us in capturing our attention throughout, even though we knew the story, so its consideration as a classic is well-deserved. 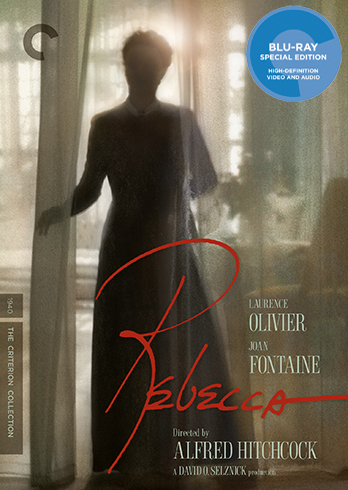 You can view Rebecca on Criterion here.